It’s not just the kids that are enjoying Metro Vancouver’s fresh sheet of snow. Earlier today, the Vancouver Aquarium’s marine mammal trainers held a “snow enrichment session” with their six rescued sea otters: Tanu, Katmai, Mak, Kunik, Rialto, and Hardy. According to Aquarium staff, the enrichment sessions provide mental and physical stimulation for the animals and gives them a chance to strengthen their bonds with their trainers. Not to mention… it’s otter-ly adorable. 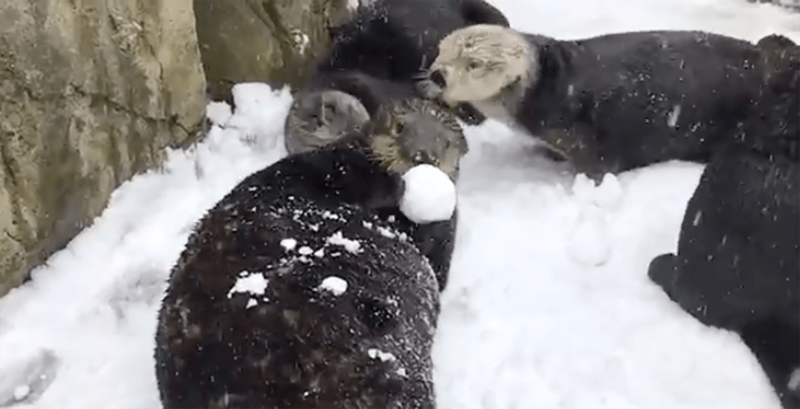 The marine mammal trainers managed to capture some footage of the six sea otters playing in the snow, and well… you should just watch for yourself. Visitors at the Aquarium can get to know the six rescued animals and their stories during daily sea otter talks. The Vancouver Aquarium is open every day from 10 am to 5 pm.